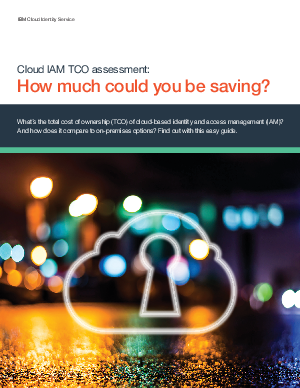 IBM » Cloud IAM TCO Assessment: How Much Could You be Saving? When choosing an IAM solution, make sure you are taking a holistic view of your program costs. IBM Cloud Identity Service helps lower total cost of ownership by reducing the need to invest large capital and operating expenditure for a non-core business function such as IAM, empowering you to invest savings in your strategic business initiatives.